As we approach 2018, we at Two Lines Press are very proud to say that all year long our publications have demonstrated how translated literature belongs at the center of America’s diverse, globally minded, inquisitive literary scene. We’re connecting with more readers than ever, in more places than ever! Support us in 2018 by purchasing a subscription this holiday season. 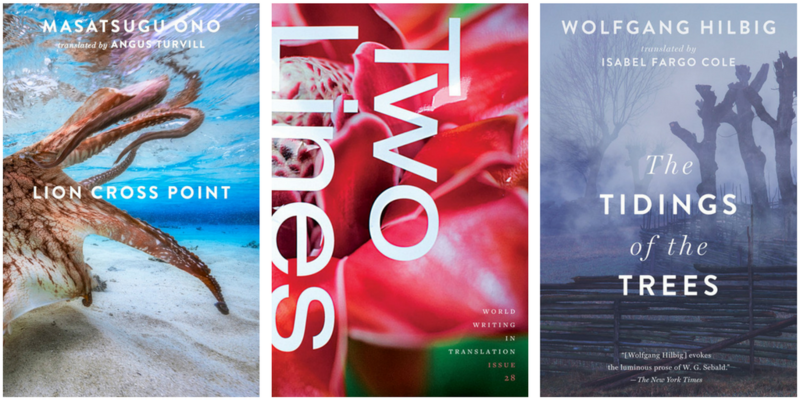 Your $50 subscription will bring you 4 new books throughout the year, plus 2 issues of Two Lines, our flagship journal of translation. 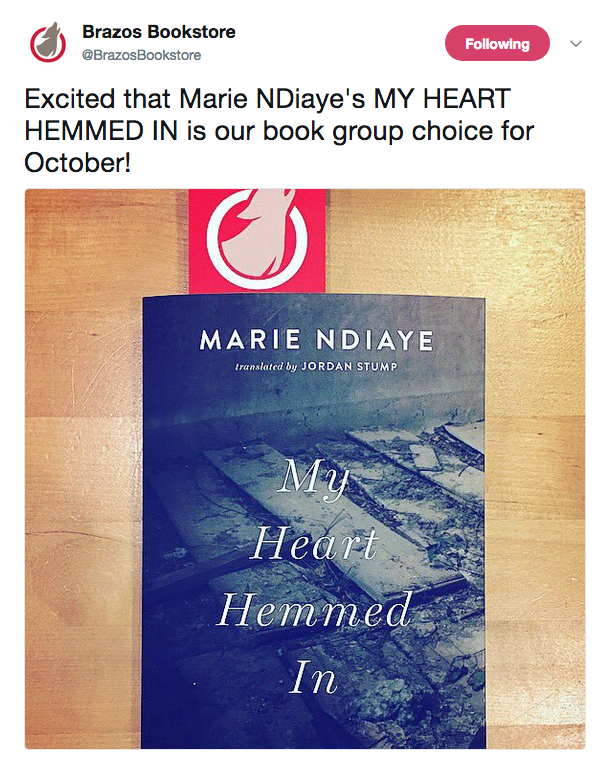 Marie NDiaye’s My Heart Hemmed In (tr.Jordan Stump) has been wrestled with by hundreds of readers, igniting conversations about immigration, class, and assimilation during translator events and book clubs at indie bookstores nationwide during the summer and fall 2017, including Chicago, Dallas, Minneapolis, and Houston. In May, translator Adam Morris talked about Brazilian author João Gilberto Noll at San Francisco’s City Lights, where a capacity crowd gathered to celebrate the launch of Atlantic Hotel. And Elvira Navarro’s A Working Woman (tr. Christina MacSweeney) was named one of Publishers Weekly’s Best Books of 2017—an impressive feat for a work of translation! We have some incredible things planned for 2018—including our first-ever hardcover book and two major author tours—and we need your support. Help us continue to bring exceptional world literature to more and more people: celebrate this work by subscribing for 2018. With our Two Lines journal—a proven resource for keeping up with what’s new and notable in the translation world—you’ll always be at the center of the conversation. 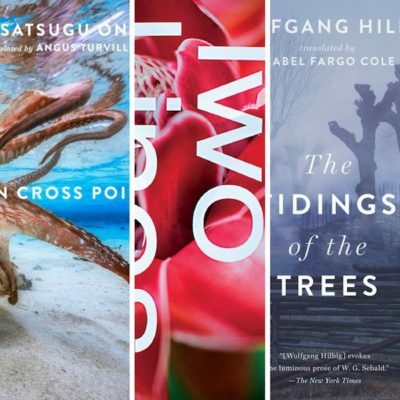 And Two Lines Press books are known for their quality, impact, and timelessness—these are exquisitely translated reads that you’ll savor, talk about with friends, and return to for years to come. A Two Lines Press subscription also makes a fantastic holiday gift! Order a subscription for the daring reader in your life, for a translation-inclined friend, or for that special someone who would savor a steady stream of outstanding literature in translation all year round. Our efficient checkout system makes it a snap to give a gift subscription this holiday season. With fall comes our first-ever book from Korea, author Kim Sagwa’s spellbinding, utterly visceral Mina (tr. Bruce and Ju Chan Fulton), raved by novelist Han Yujoo as opening readers’ eyes “to the agonizing violence of a character torn up by the inability to bear self-deception.​” This shocking, gut-wrenching title from one of South Korea’s most acclaimed young authors goes deep into the lives of teenagers pushed over the edge by the pressures of parents, peers, and cram-school education. We’ll also be touring Kim Sagwa at bookstores throughout the United States, where she’ll engage with audiences nationwide. 2018 will also see the publication of two new titles from Wolfgang Hilbig (tr. Isabel Fargo Cole), one of our most lauded authors ever, having racked up praise from The New York Times, the Wall Street Journal, the Los Angeles Review of Books, László Krasznahrokai, the Times Literary Supplement, and so many others. These are some of the richest, most beautifully written books we’ve ever published, bringing to mind the relentless invention of James Joyce and the Romantic spirit of Edgar Allan Poe. Last but certainly not least, Two Lines comes back stronger than ever in 2018 with all kinds of goodies, including a special, hand-picked folio of the very best, most avant-garde Japanese poetry, plus new work spanning languages from Albanian to Galician to French Creole and so much more. Make sure you get the best in translated literature in 2018: subscribe today!